One side of the tools is used for pushing back the cuticles & the other side is used for cleaning the tools.. Elegant designed. This tool has a cuticle pusher at one end & a convenient nail cleaner at other end. Non slip grip. Can be used with artificial nails also. 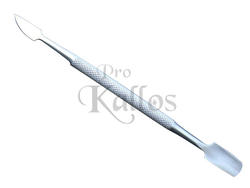 Curved cuticle pusher at one end & a nail cleaner at the other end. eeps your nails and cuticles looking at their absolute best. The angled end follows the curve of your cuticles and gently pushes them back. The unique metal-V end neatly trims the dead cuticle around the nails. The soft touch rubber handle provide a comfortable grip and prevents sliding during use. GUBB USA- 2 in 1 'manicure tools'- 'nail filer' + 'cuticle trimmer' is suitable for professional or home use.